PC Burton Caliz, 30, was found guilty of manslaughter by negligence this evening after the 9-member jury was sent back to deliberate on their decision for a second time. After Justice John “Troadio” Gonzalez concluded his summation of the trial, the jury went into deliberation at 12:33 this afternoon to decide whether PC Caliz was guilty of manslaughter or manslaughter by negligence for killing Leroy Pilgrim back in February of 2004. During the trial, which commenced on September 18 and was presented by attorney Leeroy Banner, witnesses testified about what they observed on February 12, 2004. One of those witnesses, Sanjay Pilgrim, the brother of Leroy Pilgrim, told the court that he was on a boat in the San Juan area, and his brother Leroy had just arrived there. PC Caliz and Cpl. Vidal Cajun then arrived on separate golf carts and approached Leroy to search him, Sanjay said. As PC Caliz searched Leroy, Cpl. Cajun spotted a flashlight at him and that was when another person who was onboard the boat with him, jumped into the lagoon. At that point, both the officers then searched the water’s edge in a futile effort to find the person. PC Caliz then pulled out his .38 service revolver and placed it at the back of Leroy’s head, while holding onto him from the back by gripping his shirt collar. Sanjay, in his testimony, told the court that PC Caliz then pushed his brother into the water and shot him in the back of his head, causing the fatal injury behind Leroy’s right ear. Two other witnesses told the court that they saw PC Caliz and Leroy Pilgrim in the water, but while one of the witnesses said he heard what sounded like a gunshot, the other said that what they heard sounded like a tire bursting. PC Caliz, who was represented by Attorney Richard “Dickie” Bradley, gave a dock statement in which he told the court that after Leroy Pilgrim was searched, Cpl. Cajun left Leroy in his custody and went to search Sanjay. A 9mm firearm was found and that was when Cpl. Cajun handed him his.38 service revolver because Leroy had started acting in a disorderly manner, and told him that they would not plant anything on him. According to PC Caliz, it was at that point, as he was holding onto the back of Leroy’s shirt collar, that Leroy pulled him into the lagoon and they began to struggle. It was during this struggle, according to PC Caliz, that the gun went off, causing the fatal injury to Leroy. The jury returned at 3:50 this afternoon, delivering a not guilty verdict of manslaughter, but were unable to arrive at a verdict for the manslaughter by negligence charge. They were sent back for a second time into the jury room at 3:55 p.m., and when they emerged at 4:27, they arrived at a 7 to 2 ratio of guilty. Justice Gonzalez has deferred sentencing to October 10, allowing Caliz to present his mitigation plea, and to bring character witnesses to speak on his behalf. 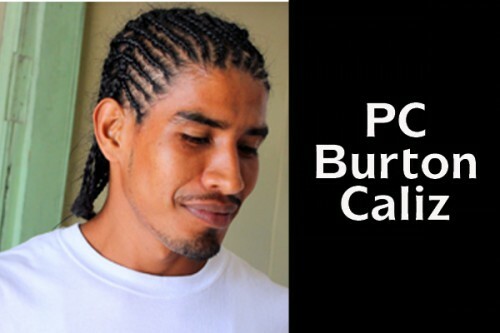 On January 29, 2007, PC Caliz was found guilty of manslaughter for Pilgrim’s killing and on March 21, 2007, he was sentenced to 10 years for the crime. But on March 7, 2008, the Court of Appeal quashed the conviction and the sentence and granted him a retrial.